Abe Cohen Plumbing and Heating Inc. is who you need to call for water pipe repair or replacement (re-piping) in industrial buildings in Ahuntsic, Baie D'Urfe, Beaconsfield, Bord du Lac, Cote Saint-Luc, Cote St-Luc, Dollard des Ormeaux, Dorval, Downtown, Hampstead, Ile Bizard, Lachine, Lacey Green, Lakeshore, LaSalle, Laval, Mile End, Montreal West, NDG, Nouveaux St. Laurent, Nun's Island, Old Montreal, Outremont, Pierrefonds, Plateau, Pointe Claire, Pointe St. Charles, Roxboro, Ste-Genevieve, St. Henri, Town of Mount Royal, Verdun, Ville St. Laurent, West Island, Westpark, Westmount. Over the years that many of our plumbing systems have served us well, the older galvanized water (supply) pipes corrode. Joints between pipes can leak, and pipes can corrode and leak. 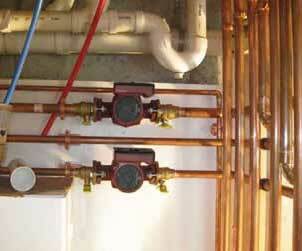 The most common indicator of problems with old piping are reduced water pressure and rust-coloured water. We can verify your water piping, and advise you on the relative value of both options: to repair or to replace. One of our advisors can explain the pros and cons of the different types of piping available today. Prior to installation, we will determine how much and of what material to acquire. when and for how long will you be without running water. It is often possible during re-piping to re-route pipes to your advantage, for example, to route pipes away from cold outside walls, to route hot water using a shorter path from where it is heated to where it is used (and therefore enjoying "faster" hot water). Other advantages and economies can be realized by rethinking the installation of pipes. At Abe Cohen Plumbing and Heating Inc., we are a three-generation family business with more than 50 years in the plumbing trade. We consider our customers to be family and friends in a long-term relationship with us. We have the experience, expertise, tools, and equipment to repair or replace piping in industrial buildings in the greater Montreal area. We are respectful, clean, and professional. We are certified and active members of CMMTQ (Corporation des maîtres mécaniciens en tuyauterie du Québec), ACQ (Association de la Construction du Québec), and certified partners of Gaz Métro for natural gas piping and installations.